As the weather continues to warm up a bit I am so excited to pull out all of my favorite swing dresses! This is such an easy look to pull together. I’ve really been digging this camo look lately and knew it would look great paired with a denim jacket. I actually intended to wear the jacket but the sun came out and it ended up styling perfectly around my waist. I tend to be such a hoarder when it comes to dresses like this… from running errands, picking up the little at school, or going to an afternoon bbq, this outfit is perfect in a pinch when you want to look put together without a whole ton of effort. This will also be my go-to for sporting events, because it can be so hard to dress for those. Adding a Red’s baseball cap would look AHHH-dorable! Also this brand is one of my absolute favorites. I always know that the quality is going to be on point and the fabric is the softest ever! I’m telling you, you’ll be hooked! I am wearing an XS and it fits perfectly, not too short either (I am a pint size 5’2″ for reference haha). As for shoes and accessories you can really swap in anything here. 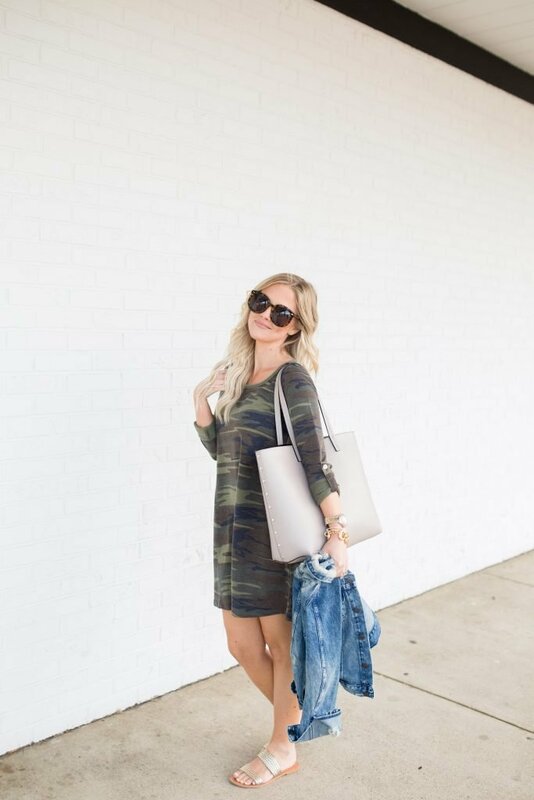 It’s fun to think of the camo print as a neutral – I decided to keep my entire look on the softer side but how fun would a colored bag or some cute tassel earrings look with this?! I will say that these sandals have turned out to be my most worn lately but I’ve also found a few look-a-likes at a more reasonable price point. You can shop all of my outfit links below as well as the direct link to my hair extensions. I am still getting a lot of comments and questions about them so if you’re interested you can read the full blog post HERE. Let me see if I still have the link!